The Archive service. The Municipal Archive of the town of El Campello is considered a local public service, managed directly by the Town Hall and governed by the rules contained in the Archive Regulation approved by the Town Hall plenary on the 25/04/90 and other current regulations. The Town Archive is made up of the organic collection of documents which are currently located in the City Hall or in any other municipal building, as well as those which are processed and resolved thereafter and are acquired or obtained in the exercising of municipal activities. All documents forming the Archive are part of the Historic and Cultural Heritage of El Campello and therefore are included, under such a legal qualification, in the Inventory of Municipal Assets. The custody, preservation, classification and cataloguing of the documental contents of the Historical Municipal Archive. The custody, preservation, classification and cataloguing of the administrative archive files and documents, sent by the management archives of the different municipal departments. The promotion and dissemination of the contents of the archive. 5Collaborating in the bibliographic research on the history of the municipality. Timetable. Public consultation: Monday to Friday from 10am till 2pm. Internal consultation and loans. Monday to Friday from 7:30am till 3pm. C/Alcalde Oncina Giner, 7. 03560. Telephone: 965 637 200. Extension: 464. Address: Management and consultation service: 3rd floor of the Municipal Library. Historical Archive documentation deposit: Basement of the Municipal Library. Pza. Canalejas. 03560. 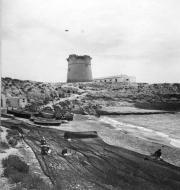 El Campello. Alicante. Telephone: 965 637 200. Extension: 600. Municipal Archive Personnel: Fernando Pagés Lledó (Archive Officer). Encarnación Espallardo Calatayud (Archive Assistant).